I am a great fan of the saxophone and recently, I ventured into the market searching for a good beginner saxophone. After an intense search, I came across the Kaizer Student Tenor Saxophone, and I fell for it. Here is a brief review of why I fell for this saxophone. Included herein are the close alternatives of Kaizer Student Tenor Saxophone that I came across while doing my search. 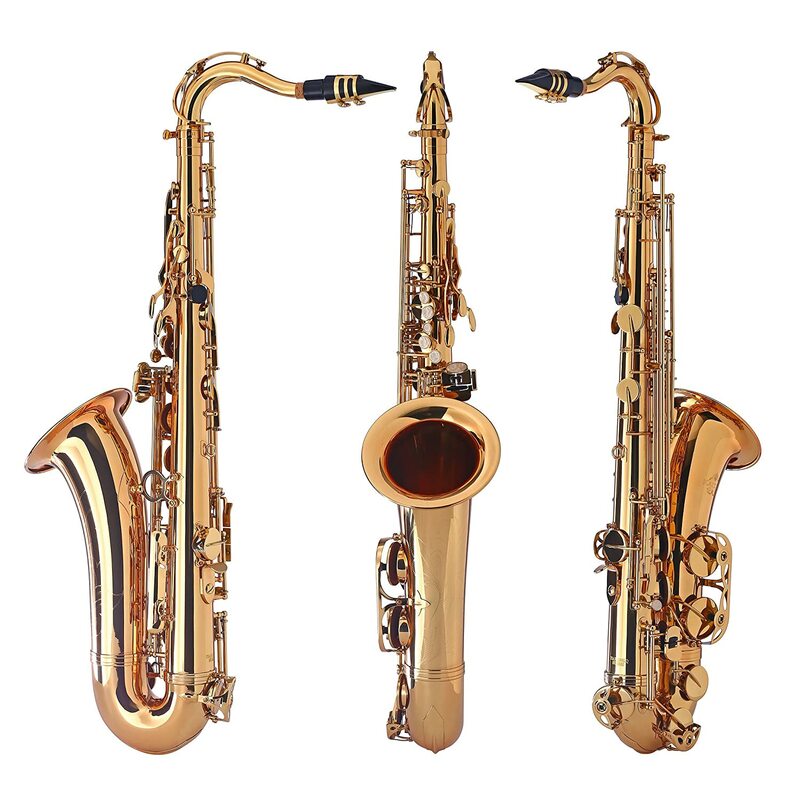 If you are looking to enjoy a saxophone, then you have to purchase one that is of good quality. It is imperative to conduct adequate research because there are numerous saxophone brands in the market and buying impulsively could have you stuck with a poorly designed instrument. The Kaizer Student Tenor Saxophone is one of the best beginner saxophones for students. This instrument is well crafted to deliver quality sound and enable easy playability. It is designed to eradicate the need for another intermediate saxophone. The Kaizer Student Tenor Saxophone Standard B Flat Bb Nickel Silver is built for to last long with minimal repair needs. Moreover, it comes at a great price that matches up to its value and functionality. This saxophone is especially designed for beginner students, and if you would like to advance to a professional level instrument, you’ll need to get yourself a Pro Student Series saxophone. This particular saxophone’s body is made of high quality brass, which improves its tonality and longevity. The Kaizer Student Tenor Saxophone has a Nickel Silver body, and it has excellent construction with enhanced tonality. I would recommend this saxophone because it offers what anyone would be looking for in a good beginner’s saxophone. The Kaizer Student Tenor Saxophone is designed to serve you for longer periods. If you ask me, a durable instrument is the best because it saves you a huge chunk of cash in replacement and maintenance cost. More so, its construction is tough and low maintenance. This saxophone also features a padded leatherette that ensures that the instrument is free from corrosion wear. I would highly recommend this instrument to anyone who is passionate about saxophones, and those starting their lessons. This saxophone features Bb keys, which are perfect for a beginner student, orchestral players, and a students’ band alike. More reasons to adore this SAX is because it features premium steel springs to give its player full control and fast action. The premium steel strings also contribute in building your confidence as you play. Just like most high-quality instruments, this beginner’s trumpet is also quite resourceful and reliable. When you purchase the Kaizer Student Tenor Saxophone, you can rest assured that you get a lifetime warranty coverage and free reliable service (labor and parts) for 2 years. If you’re looking to buy the instrument now, I would recommend that you buy it from Amazon because they have a special offer that features an extended warranty plan that offers free parts and labor coverage for 4 years. The Kaizer Student Tenor Saxophone is one of the best beginner’s saxophone because it also includes accessories. This SAX features a molded case to protect the instrument, a ligature set, and a complete mouthpiece. Furthermore, this SAX comes with a full saxophone maintenance kit, which comprises a lubricant for mouthpiece, gloves, a polishing cloth, and a cleaning rod. The Aklot Bb Gold Beginner Tenor Saxophone is yet another saxophone that you could enjoy playing. It features a gold lacquered Bb with #F Tenor Saxophone, and it is best suited for beginner students. It also features bluing springs, stainless steel screws, keys with leather pad, and a high-grade neck cork. If you are a beginner looking for an alto saxophone, this is the choice for you. It allows easy blowing plus it offers the player a sturdy and responsive key work that offers you excellent playability and tonality. This sax features blue steel needle-springs and comprises of high-quality pads. It also has a protective case and accessories. Offers excellent tonality plus it’s of superior quality. If you are in the market looking for a reputable instrument other than the Kaizer Student Tenor Saxophone, I would recommend the Jean Paul USA AS-400. This instrument features a case, a yellow brass body with a lacquer finish, and accessories such as a cleaning cloth, gloves, case, and a mouthpiece. There are numerous saxophone brands made throughout the globe. However, only a handful of them could justify their price. The Kaizer Student Tenor Saxophone is one of the high standard beginner saxophones. With this saxophone, you are guaranteed enhanced tonality, increased playability, and optimum durability. For overall beginner saxophone reviews and guide, you may visit our homepage.